The Bronze Medal is the lowest quality foosball table made by the Dynamo brand. The Bronze still has a flat table surface and Dynamo style men, but it lacks many foosball table features that really set the Dynamo tables apart from some other manufacturers. The Bronze Medal has a lightweight cabinet that will cause the table to shift during heavy play. It also has 1 inch sidewalls instead of 1 1/2 inch, end ball returns instead of side ball returns, and legs that are not adjustable to easily level the foosball table legs. 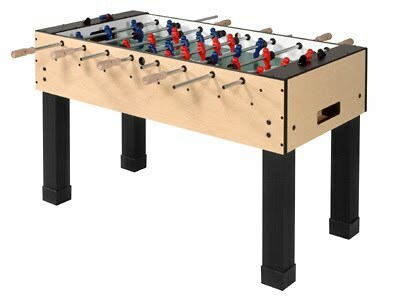 This foosball table is priced at around $400 US.